Traci Sanders is a multi-genre, multi-award-winning author of ten published titles, with contributions to three anthologies. An avid blogger and supporter of Indie authors, she writes parenting, children's, romance, and nonfiction guides. Traci recently released a series of books for authors. "I'm so excited to be able to help more authors through my books, since I can't personally be everywhere at all times. It's like having me in your back pocket." To enter, all you have to do is send your proof of purchase of a digital copy of either of these two books during the tour. Traci will draw TWO winners total, at the end of the tour. TIP 147: Hurry up and slow down! 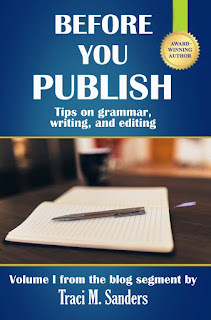 This tip can be found in Before You Publish: Tips on grammar, writing, and editing, now available in digital and paperback format. Pacing is one of the toughest skills to master in writing, in my opinion. Proficient pacing talent can derive from many sources; however, one of the most convenient and practical sources is reading. 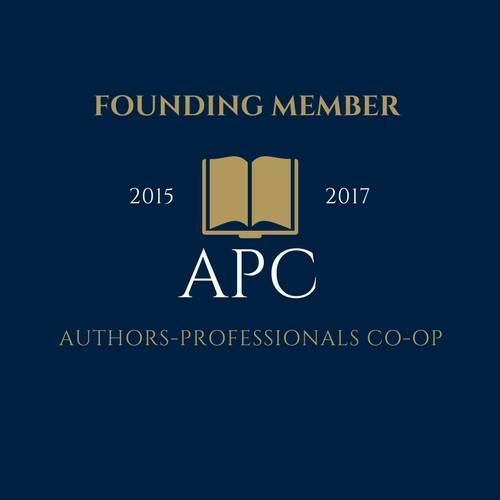 Avid readers become better writers. Let’s delve into the art of pacing a bit more. Readers prefer a harmonious mix of fast and slow moments throughout a book most of the time. I’m not talking about having “lulls” within the book; I mean providing moments for the reader to catch his breath. This even applies to thrillers and horror stories. Every paragraph/chapter can’t contain edge-of-the-seat writing. We don’t want to give our readers heart attacks, and we don’t want to give too much away in the beginning either. While it’s true that an inciting moment works well at the beginning of a book, that doesn’t mean ALL the inciting moments must be crammed in there. Remember, each chapter, paragraph, and line in great writing exists to move the story forward—but not necessarily at warp speed. *Dialogue – I’ve read books that were 90% dialogue (which told every, single action and feeling a character exhibited), and others that were only 10% dialogue (which incorporated too much narrative and/or backstory that became boring to read.) There has to be a healthy balance of both to keep the story interesting. *Action – This is especially true with sci-fi thrillers, suspense, crime thrillers, and horror stories. You do want to keep a reader on the edge of the seat for the most part, but you don’t want to make every sentence/paragraph action-packed. If you do, you end up with an element of “Really? Come on!” as some moviegoers have expressed about the Mission Impossible movies where Tom Cruise goes from riding a motorcycle to driving a boat to hanging from the wing of an airplane in about two minutes flat. I personally find it to be overkill. 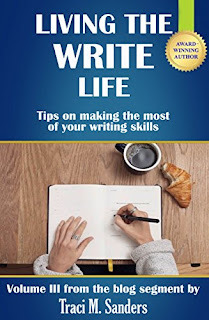 *Word choice – Sentence structure plays a huge role in pacing. Short, non-detailed sentences speed the story up and create a sense of urgency and suspense while long, drawn-out sentences can evoke an emotional connection and may cause the reader to slow down and think about what he/she is reading. Using strong verbs like punched, clawed, dragged, heaved, sobbed, etc., move the story forward as well by creating a moment of “crisis”; the reader keeps going to find out how the crisis will be solved. *Summarizing by omission – This speeds the story up just enough to keep the reader invested. For instance, instead of describing every, single action a character takes—such as a woman standing, walking toward the door, turning the knob, opening the door, and walking out—the author might write it as her simply walking out the door, skipping all the other details. Common sense comes into play here, and readers don’t usually enjoy being treated like idiots. They know that the character had to walk to the door and open it to get out. And even if the door was open to begin with and the character simply walked through it, who cares? These are just a few tips to regulate pacing in your story. Have you ever had to stop writing (or editing) to ask yourself, "Is this the correct word?" or "Is this spelled correctly?"? At this point, most authors will stop writing and search a few online dictionaries or thesauruses, only to realize an entire half hour has been wasted, because many of the online sources conflict. Fret no more, authors. This guide is a one-stop source for nearly any grammar, spelling, or creative-writing issue you can stumble upon. 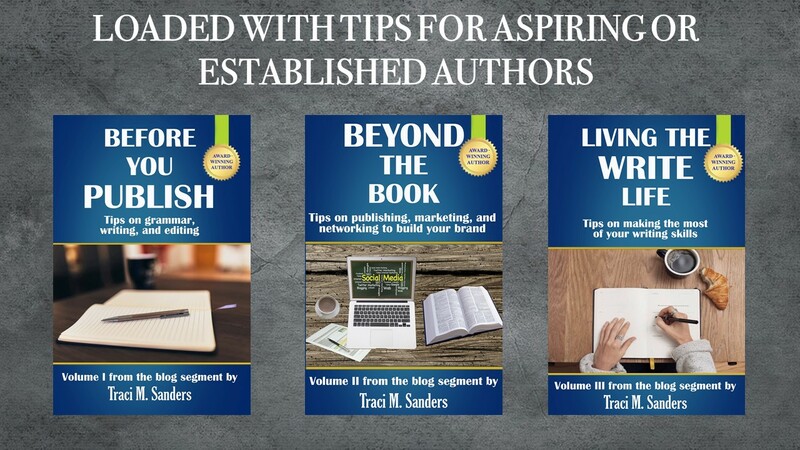 Author Traci Sanders devoted an entire year to topics just like these in her blog segment Write It Right, which can be found by visiting www.awordwithtraci.com. Each tip has been thoroughly researched for accuracy, according to the Chicago Manual of Style. No need to waste time searching the Internet! Sanders has done the hard work for you. You've published your book. Congratulations! Now the real work begins. Although many marketing professionals recommend authors begin promoting their work months (and even years) before publishing, some authors miss that deadline, and are left feeling clueless on how to go about getting their work into the hands of readers. Whether publishing your first book, or your nineteenth, you are guaranteed to find unique tips inside to market your work, and network with other authors and readers to build a strong following. 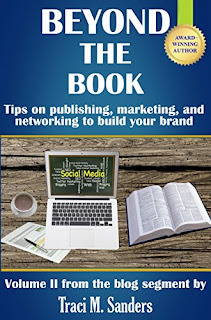 Authors must have a marketing plan in place if they want to generate book sales. However, with 5000+ titles being launched on Amazon daily, it's easy for your work to become lost in the crowd. The tips found in this guide will inspire you to find new, unique ways to market your work and build your brand. A few of my personal recommendations for writing resources are listed in here as well. All this and more can be found in this one handy guide to help you Live the Write Life.